Playing hours of Journey giving you cravings to watch Journey on YouTube? Or maybe DiRT Showdown put you in the mood to watch real-life action sports from the Red Bull YouTube Channel? Give button mashing a whole new meaning with the new YouTube app for PlayStation 3—rolling out today in North America for free download from the PlayStation Store. You might have watched YouTube on PS3 before, but get ready for a whole new world of video and features. We have a completely new experience, designed for the big screen and PS3 controls. Here’s what you’ll find: Search: Finding the videos you want is easier than ever, with search suggestions and instant video results while you type. 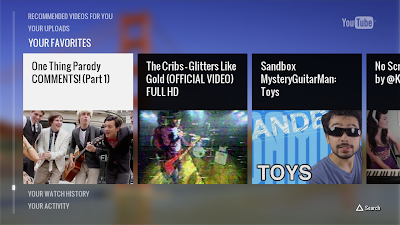 Your subscribed channels: Sign in to find the latest videos from your YouTube subscriptions, which now also includes HD and official music videos. Your phone as a remote: With a quick pairing process, you can control YouTube on PS3 with a smartphone. Find a video on your phone and with a button it’ll play on the big screen. While the video is playing you can control it from the phone, or keep browsing YouTube for the next one. You’ll find the new app in the PlayStation Store under My Channels. We’ll keep improving the PS3 experience and plan to bring the app to more countries in coming months.